When I toured Motley Fool last year, I was impressed by the number of people I saw using standing desks. The treadmill desks and cycling desks they had weren't being used when I was there, but a lot of folks were standing. After my visit, I talked with our facilities director about offering a standing desk to ASHA staff and he agreed to pitch the idea to our CEO with me. I really had no idea how many people would want to stand while they work. We conducted a little survey to see how many folks would be interested and 150 people responded that they would. That's over half of our staff of 280. We plan to start by purchasing 100 units. I hope to eventually accommodate everyone who wants one. We set up a demo model and we have people coming by to kick the tires and take it for a test drive to affirm their interest. (You can see Paul, one of ASHA's audiologists, testing it out in the picture.) Zack Koutsandreas, the ergonomics expert that works with us, recommended an Ergotron desk mounted product. We like the way it attaches to our desks and how easy it is to raise and lower. 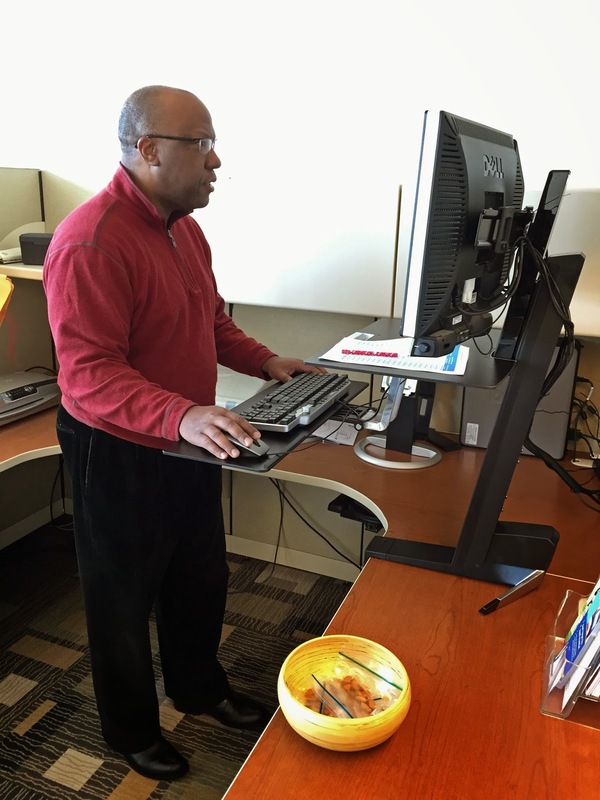 Interested in trying a standing desk? Maybe you can use these articles to make your case.